The Hot Tresses range is everything good. I cannot rave about it enough. This range is the epitome of hair CARE. We’ve all heard the following words used to describe beauty products before, but I want us to take a second to process them slowly: cleansing… nourishing… hydrating… smoothing… revitalising… The Hot Tresses range is all this, and more. Finding a downside with this range has been difficult. I almost settled on the price, but for what you get and how long the products last it’s worth every cent. The product is more concentrated so less is needed, making the range last a lot longer than any other haircare range I’ve used. The incredible formula also balances hair and scalp meaning that the scalp gets less oily (and less dry!) so hair doesn’t need to be washed as often. So, I took a step back. What’s the downside?… The only downside right now would be international shipping costs for those outside of Australia. 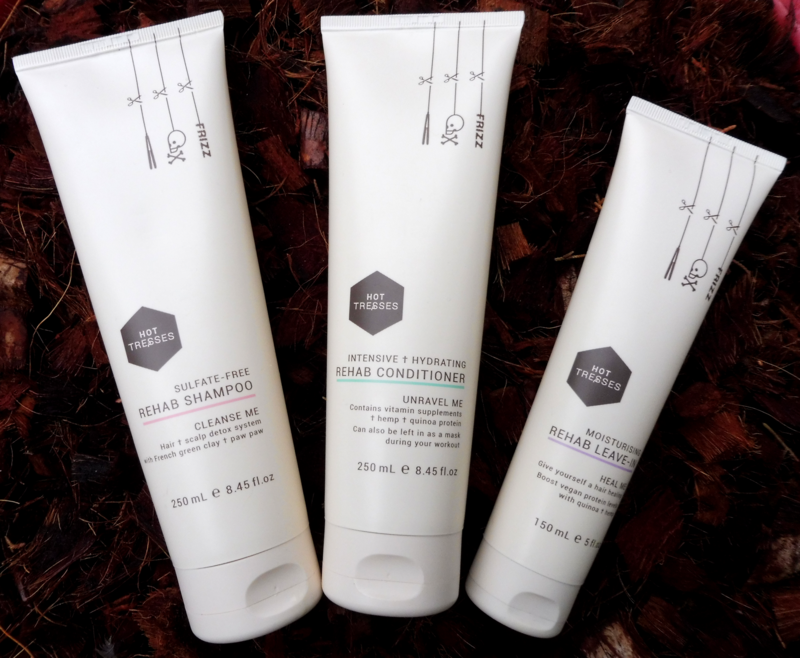 Maybe one day this little Aussie brand will take over the world and be available everywhere, but in the meantime – no matter where you are – this range is a worthwhile investment in your hair. I always have high hopes for new haircare, but within weeks I can’t wait for the tubes to run out so I can try something else (this is why I review products until I really get a feeling for them before writing my reviews). If you have read this far then you will know already that the Hot Tresses range changed that. I have now found my holy grail hair care range, and just like the Montalto Biolinfa Essenzial oil I never want to be without it again. The Hot Tresses rehab sequence is the culmination of almost five years of research and development by the creators, alongside a team of highly innovative female chemists and hairdressers. Australian made and owned, this indie brand launched less than six months ago is taking the natural and vegan beauty scenes by storm, and with good reason. I have now used the trio for almost three months, and I will absolutely get a full three months out of the range. I don’t know about you, but for me that’s incredible. Usually I would need to replace my haircare monthly, and I would go through two tubes of conditioner for every tube of shampoo – at least. With the Hot Tresses range I am going through them pretty evenly, and other people that I’ve discussed this with have said the same. I also feel like I need to use far less of all three products than I am used to, and not having to fill up my palm with conditioner is a crazy new experience for me. I was co washing for about six months prior to trying this range, and while I did notice a significant improvement in the dryness of my hair while doing this, it wasn’t the dramatic change I had hoped it would be. From the first time I used the Hot Tresses range I noticed a huge difference in the way my hair dried, and every subsequent wash it has felt better and better. It’s clean without being dried out, it’s hydrated without feeling heavy or greasy, and it dries without turning me into something reminiscent of Sideshow Bob. Honestly, I’m pretty lazy when it comes to my own hair and makeup most days. I don’t want to have to style my hair every day, and I am so happy that I have discovered this range and its air dry movement, and I’m now able to embrace my laziness and know that it’s good for my hair. The shampoo doesn’t strip my hair and leave it feeling like straw, and the conditioner and leave in detangle even the most tangly tangles. When I do heat style my hair I use the leave in as normal and it acts as a heat protectant, and gives my hair a beautiful finish. I now wash my hair less than I ever have before (1-2 times a week) and it never really feels greasy at the roots or dry at the ends. I am also pretty sure that my hair has grown faster than normal these last three months, but without actual measurements I can’t say this for certain. All I can say for certain is that I have found my hair’s new best friend. With Ylang Ylang essential oil featuring throughout the range, we also get the added benefits of aromatherapy. Ylang ylang has long been known to relieve stress and anxiety, alleviate depression, calm frustration and anger by lifting the mood, act as an aphrodisiac, and even helps to regulate sebum production. It also smells incredible. Use the shampoo as a brush cleaner and you will have no regrets. Just a little bit of this magic stuff got my brushes sparkling clean, and the conditioner makes a nice monthly treatment for them as well. Some of my lippy brushes needed a massage with some coconut oil before shampooing to get them perfectly clean, but that’s normal. The Hot Tresses range is available worldwide from their website, and from Amazon. Due to last years overwhelming success of HT in America we are now completing larger production runs here in Australia. Inline with our core value to making beautiful natural hair accessible to everyone globally, we have decided to pass this value onto our customers. If you have any questions regarding the change of pricing or the products please don’t hesitate to let us know.